Background and objectives Immediate-release cysteamine bitartrate (Cystagon; Mylan Pharmaceuticals, Canonsburg, PA) may prevent or delay kidney transplantation and other serious outcomes in patients with cystinosis, but has never been subjected to a prospective clinical trial. Cystagon efficacy requires strict lifelong dosing every 6 hours. Such a dosing schedule and Cystagon-associated side effects are often cited by patients as reasons for nonadherence. Design, setting, participants, & measurements This open-label, randomized, controlled, crossover trial was powered to show that a new delayed-release formulation of cysteamine bitartrate, RP103, taken every 12 hours, was noninferior to Cystagon for maintenance of white blood cell (WBC) cystine at levels associated with optimal outcomes in the disease. Results Forty-three patients were randomized. Using a mixed-effects statistical analysis model, the least-squares mean peak value of WBC cystine level was 0.62±0.05 nmol 1/2 cystine/mg protein after 12 hours under RP103 and 0.54±0.05 nmol 1/2 cystine/mg protein after 6 hours under Cystagon, a difference of 0.08±0.04 nmol 1/2 cystine/mg protein (95.8% confidence interval, 0–0.16). The average steady-state total daily dose of RP103 was 82% of the incoming steady-state total daily dose of Cystagon. There were three-fold more gastrointestinal side effects compared with using Cystagon. Conclusions A new delayed-release Q12H formulation of cysteamine bitartrate is not inferior to the Q6H formulation (Cystagon) in maintaining low WBC cystine levels in patients with cystinosis but at a lower total daily dose. Nephropathic cystinosis, an ultra-orphan disease, is an autosomal recessive inborn error of metabolism characterized by the inability to transport cystine from the lysosomes due to a dysfunctional or missing cystine transport protein, cystinosin (1–3). Due to ineffective removal of intralysosomal cystine stores, cystine crystals accumulate and damage various organs, especially the kidney. Cystinosis leads to renal tubular Fanconi syndrome and progressive glomerular failure, with ESRD by the end of the first decade of life (4). In four studies of cystinosis patients before immediate-release cysteamine (also known as mercaptamine) was available, ESRD occurred at a median age of <10 years (5–8). Patients with cystinosis also experience linear growth failure, rickets, and photophobia due to cystine deposits in the cornea. With time, most organs are damaged, including the retina, peripheral muscles, heart, thyroid, pancreas, and central nervous system, among others (9). Cysteamine is an aminothiol that crosses the cell membrane and penetrates and reacts within lysosomes, resulting in a thiol-disulfide interchange reaction that converts cystine into cysteine and cysteine-cysteamine mixed disulfide. Both compounds subsequently can exit the lysosome in patients with cystinosis through other intact, disulfide transporters (10). The marketed immediate-release cysteamine bitartrate, Cystagon (Mylan Pharmaceuticals, Canonsburg, PA), is a cystine-depleting agent that is the only specific cystinosis treatment. Retrospective data analyses have demonstrated that kidney functional decline, and perhaps other organ functions, can be delayed and sustained, respectively, when a biomarker of the efficacy of cystine depletion, white blood cell (WBC) cystine, is <2 nmol 1/2 cystine/mg protein (11,12). There have been no prospective trials with Cystagon for the therapy of cystinosis. Patient adherence with Cystagon is challenging due to its dosing frequency, significant adverse effects, and the need for lifelong treatment from the age of diagnosis (13). Because Cystagon must be taken every 6 hours (Q6H) around the clock based on the pharmacoefficiency of cystine depletion, patients must be awakened in the middle of the night to be fully adherent. One study demonstrated that <25% of patients (5 of 22) were actually adhering to this regimen (14). There is evidence that failure to adhere to this strict Q6H dosing regimen results in more rapid deterioration of kidney function as WBC cystine levels rise (13). A small pilot trial suggested that a delayed-release Q12H formulation of cysteamine, EC-Cysteamine, was able to maintain WBC cystine levels comparable with the marketed immediate-release Q6H formulation (15,16). RP103 is a new formulation, in both 25-mg and 75-mg capsules, that uses a beaded, enteric-coated, delayed-release form of cysteamine bitartrate, in which the microspheronized beads are further encapsulated in a hard gelatin to allow oral administration on an every 12 hours basis. 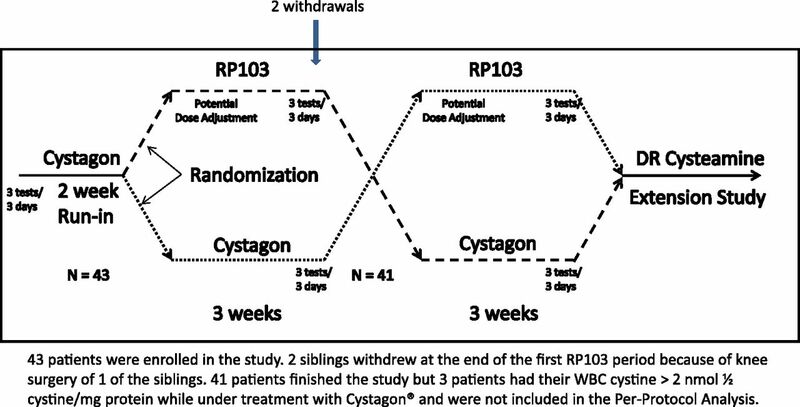 Herein, we report on a randomized, controlled, crossover clinical trial to test the hypothesis that there is similar WBC cystine depletion comparing RP103 versus Cystagon in patients with nephropathic cystinosis and their own kidneys. We studied adverse event occurrence at the same time with the two agents. We used a randomized, controlled, crossover design. Eligible participants (see below) entered a 2-week run-in period, at the beginning of which the trough cysteamine concentration and the highest (peak) WBC cystine level were measured every morning over 3 consecutive days. Thereafter, the patients were randomly assigned to the RP-103 or Cystagon arms, each of which was 3 weeks in duration. The primary endpoint of the overall study was based on the comparison between RP103 versus Cystagon peak WBC cystine levels measured every morning over 3 consecutive days at the end of each of the corresponding 3-week treatment crossover periods. Proton pump inhibitor (PPI) therapy use during the Cystagon arm was at the discretion of the patient and/or the study physician, whereas PPI use was discontinued initially during the RP103 arm but could be restarted (or continued) by either the patient or the study physician. PPI use during the RP103 arm was discontinued to maintain an optimal pH environment in the stomach for optimal kinetics of the drug. Patients were not randomized based on PPI use. The study could not use a placebo or be blinded for several reasons, including the dosing schedule; different strengths of RP103 capsules compared with Cystagon; body odor and halitosis associated with cysteamine metabolism, which may have been different between the two products; and the individualized dose levels of patients with Cystagon. The protocol and consent/assent documents were approved by the institutional review board and/or ethics committee at each participating center. This study was registered under investigational new drug number 103694 in the United States and EudraCT number 2009-017882-42 in France and the Netherlands. The study is listed on www.clinicaltrials.gov. Eight sites recruited patients for this study, three in the United States and five in the European Union. Participants in this study were male or female adults or children who were able to swallow their typically administered Cystagon capsules intact. Before the study, participants had to be taking a stable dose of Cystagon considered by the site investigator as sufficient to maintain their WBC cystine level at ≤2.0 nmol 1/2 cystine/mg protein. Participants had to have their own kidneys, with an estimated GFR >30 ml/min per 1.73 m2 body surface area by the appropriate formula for children or adults, respectively, using the new Schwartz formula (17) or the Modified Diet in Renal Disease equation (18). Participants continued all concomitant medications during the run-in period, including gastric acid reducing agents such as PPIs, which they used during their routine clinical care. After the run-in period noted above, participants were allocated centrally to continue with their usual Q6H daily dose of Cystagon or to switch to a Q12H daily dose of RP103 equal to approximately 70% of their usual dose of Cystagon (based on a preliminary study; data not shown) (Figure 1). At the beginning of each crossover period, trough cysteamine concentration and peak WBC cystine level were measured every morning for 3 consecutive days. Initially, for patients taking RP103, the dose could be increased once by 20%–25% (i.e., up to approximately 90% of the daily dose of Cystagon) when the mean level of WBC cystine was greater than the mean level of WBC cystine during the run-in period or the previous crossover period under Cystagon. Study design. We enrolled 43 patients in this study. Two siblings withdrew at the end of the first RP103 period because of knee surgery of one of the siblings. Forty-one patients finished the study, but three patients had WBC cystine >2 nmol 1/2 cystine/mg protein while under treatment with Cystagon and were not included in the per-protocol analysis. DR, delayed release. At the end of each 3-week crossover period (i.e., after treatment with either Cystagon or RP103), the trough cysteamine concentration and the peak WBC cystine level were again measured each morning for 3 consecutive days. The end-of-crossover period peak WBC cystine values were the only measurements used for the primary endpoint. In addition, a complete pharmacokinetic evaluation was performed on the third day to evaluate secondary endpoints. All concomitant medications were continued unchanged during both crossover arms of the study, with the exception that patients were asked, if possible, to discontinue PPIs during the RP103 arm. However, patients could continue to take PPIs, restart them, or have them restarted at the discretion of the study-center investigator. At the end of the entire crossover study, participants had the opportunity to enroll in an extension study to continue treatment with RP103. Of the 41 study participants who completed the crossover study, 40 participants (97.6%) chose to do so. The Cystagon package insert gives directions for the use of the drug with respect to the desired WBC cystine level. Variability exists in the measured cystine content in different cells. Some of the variability arises from the method used to determine the amount of protein to which the cystine content is indexed. There is no explicit reference in the Cystagon package insert as to which protein assay should be used to determine WBC cystine. Some laboratories have used the Lowry assay (19) and historical results reported by these laboratories have been cited in publications, making the Lowry assay somewhat of a reference method, although not yet validated, by default. The method for the analysis of cellular total protein in WBCs for this study was the validated bicinchoninic acid assay (BCA) total protein method (20). However, consistent and systematic differences were noted between the total protein results reported by the BCA and Lowry methods (21). Based on these experiments, we determined the following relationship between the Lowry and BCA protein methods: protein amount [Lowry] = (protein amount [BCA] × 1.6999) − 0.0648. We report the WBC cystine values as per the Lowry protein content. Pharmacokinetic parameters were determined and then analyzed using noncompartmental methods to obtain estimates of parameters (Phoenix WinNonlin standard, version 6.2; Pharsight Corp, Cary, NC). The primary endpoint served as the primary pharmacodynamics measure because the WBC cystine level reflects only the action of cysteamine. The use of concomitant gastric acid reduction therapies with PPIs was tabulated during both the Cystagon and RP103 arms of the study. Adverse events were coded by standard Medical Dictionary for Regulatory Activities methodology (22) and tabulated as a secondary outcome of interest. We looked for adverse event (AE) and severe adverse event (SAE) outcomes that differed from those listed in the Cystagon package insert (23) and we looked for a different relative frequency of known AEs and/or SAEs from those listed for Cystagon in the package insert. We defined comparability of side effects to be present between the two agents if no AEs or SAEs with RP103 occurred that were not listed for Cystagon, and if the relative frequency of those known AEs and/or SAEs were the same between the two agents. AEs were collected in a standard fashion as promulgated by the International Conference on Harmonisation for good clinical practice (24). As noted in the International Conference on Harmonisation guidelines, an AE is defined as any untoward medical occurrence in a patient or clinical investigation participant administered a pharmaceutical product and which does not necessarily have a causal relationship with this treatment. A SAE or reaction is any untoward medical occurrence that at any dose either (1) results in death; (2) is life-threatening (life-threatening refers to an event in which the patient was at immediate risk of death at the time of the event; it does not refer to an event that hypothetically might have caused death if it were more severe); (3) requires inpatient hospitalization or prolongation of existing hospitalization; (4) results in persistent or significant disability or incapacity; (5) is a congenital anomaly or birth defect; or (6) is medically significant, and although not included in the above list, is an important medical event that may jeopardize the patient or require medical intervention to prevent one of the outcomes listed above. Discontinuation of the study drug or conduct of additional diagnostic evaluations, will not, by themselves, satisfy the criterion for a medically significant event. The intent-to-treat (ITT) population for the primary endpoint was defined as all patients (n=41) who completed the run-in period and the two 3-week crossover periods. The ITT population for safety analyses is defined as all patients (n=43) who received at least one dose of either Cystagon or RP103, starting with the first day of the run-in period. The per-protocol population was defined as all patients (n=38) from the ITT population for efficacy less three patients who had a 3-day average WBC cystine level >2 nmol 1/2 cystine/mg protein during one of the periods under Cystagon and were therefore considered as “not well controlled” under Cystagon. The initial sample size calculation and the predetermined noninferiority margin (0.3 nmol 1/2 cystine/mg protein) were based on a study from the University of California at San Diego study (15) of weekly steady-state serial measures of WBC cystine levels from seven patients treated with Cystagon followed by treatment with an enteric-coated cysteamine bitartrate (EC-Cysteamine). Statistical analyses were performed with SAS software (version 9.2; SAS Institute, Cary, NC). Forty-three patients were randomized. Thirty-eight patients were included in the primary efficacy analysis. Patients were mostly children, male or female, with an average age of almost 12 years and an estimated GFR of 86±34 ml/min per 1.73 m2 (Table 1). The ITT population had five more patients than the per-protocol population because of the following: (1) two siblings withdrew from the study because one had planned (prestudy onset) orthopedic surgery, unrelated to the study drugs, and the family decided to withdraw both children related to subsequent travel difficulties; and (2) three different participants had a 3-day average WBC cystine level >2 nmol 1/2 cystine/mg protein during one of the periods under Cystagon and could not therefore be considered as well controlled under Cystagon. The mean peak WBC cystine level (least-squares mean ± SEM) measured in the per-protocol population of patients treated with Cystagon was 0.54±0.05 nmol 1/2 cystine/mg protein, compared with a mean peak value of 0.62±0.05 nmol 1/2 cystine/mg protein for patients treated with RP103. The mean difference was 0.08 nmol 1/2 cystine/mg protein, and the 95.8% confidence interval was 0.00–0.16. To note, we used the 95.8% instead of 95% to take into account a sample size re-estimation calculation that was performed after 20 patients were enrolled. The upper end of the confidence interval (0.16) was lower than the 0.3 noninferiority limit defined a priori (P<0.0001). Table 2 summarizes the results of the mixed-effects model regarding treatment group on peak WBC cystine level. When we performed the same analysis in the ITT population (Table 2), we determined that RP103 was not only noninferior but also superior to Cystagon, with a WBC cystine level (least-squares mean ± SEM) difference of −0.27±0.36 nmol 1/2 cystine/mg protein, respectively. The outcome of noninferior WBC cystine levels was achieved at a lower average daily dose of RP103 (1513±477 mg/d) compared with Cystagon (1801±511 mg/d). On average, the total daily steady-state dose of RP103 in patients in the phase 3 clinical trial was 82% of their established incoming dose of Cystagon. There was no statistical difference in the mean peak plasma concentration (Cmax) between the two drugs. The observed treatment effect on peak WBC cystine levels is consistent with the pharmacokinetic and pharmacodynamic profiles over 6 hours after a morning dose of Cystagon and over 12 hours after a morning dose of RP103, dosed at a lower to equal daily dose (70%–100%) (Figure 2 and Table 3). A slower absorption of cysteamine due to the delayed-release formulation RP103 drives the pharmacokinetics and leads to a similar peak of cysteamine as after Cystagon but with a prolonged plateau time (note the nearly three-fold variability of the achieved time to Cmax [Tmax] in Table 3 for RP103 compared with Cystagon). Comparison of cysteamine concentration and white blood cell cystine level over time. There was noninferiority of WBC cystine measured at 12 hours after dosing under RP103 compared with WBC cystine measured at 6 hours after dosing under Cystagon. Conc, concentration; WBC, white blood cell. Mean values for principal cysteamine pharmacokinetics parameters after one dose under steady-state treatment with Cystagon or RP103 are noted in Table 3. We found that the pharmacokinetics parameters for Cystagon in Table 3 were consistent with what is described in the Cystagon package insert, with a Cmax of 2.6 mg/L, total exposure area under the curve (AUC0–6h) of 378 min × mg/L, a Tmax of 96 min, a clearance (Cl/F) of 1.2 L/min, and apparent volume of distribution (Vd/F) of 156. As expected, because RP103 is a delayed-released formulation of the same compound, cysteamine bitartrate, the Tmax for RP103 was longer than for Cystagon (187±89 min versus 72±31 min, respectively) but the derived plasma clearances were similar (1.11±0.58 L/min for RP103 versus 1.33±0.50 L/min for Cystagon). Entering the run-in period, 18 of the 38 (47%) per-protocol patients in the study took PPIs and continued them during the Cystagon arm of the crossover study. Overall, PPIs were taken 453 times during the Cystagon treatment periods. As requested, 13 of the 18 (72%) of the patients using PPIs during the Cystagon period stopped them during the RP103 period, and no other study patients started them. Thus, five patients took PPIs for a total of 58 times during the RP103 treatment period, representing an 87% reduction in PPI use during identical time periods. There was no period effect in PPI usage during either arm, based on the randomization scheme (data not shown). However, because the protocol asked for cessation of PPI use, and patients were not randomized for PPI use during either arm, we did not evaluate this statistically. There were no significant differences in any laboratory parameter measured between Cystagon and RP103 during the trial. None of the SAEs either under RP103 or under Cystagon was unexpected (23). More individual patients experienced at least one SAE under RP103 than under Cystagon (six versus one, respectively) but only one SAE under RP103 was considered by the site investigator as possibly related to cysteamine treatment. That patient did not take RP103 for 2 days after the SAE; however, because this SAE spontaneously resolved, the patient completed the study and was included in the per-protocol efficacy analysis. One SAE was a right cervical femoral fracture from a fall, and one was elective knee surgery for genu valgum that was planned before study start. The other five SAEs were gastrointestinal related. All of these SAEs were considered as resolved by the site investigator, and patients were discharged from the hospital and were able to remain in the study. As with Cystagon, AEs under RP103 were mostly gastrointestinal side effects. A total of 119 AEs and SAEs were reported during the crossover periods of the trial (Table 4). Almost half of these AEs (54 of 119, 45%) were gastrointestinal symptoms. Of 54 gastrointestinal AEs that occurred during the crossover periods only, 70% (37 of 54) were considered by the principal investigator as possibly or probably related to the drug (44% to RP103, 15% to Cystagon, and 9% to both Cystagon and RP103). 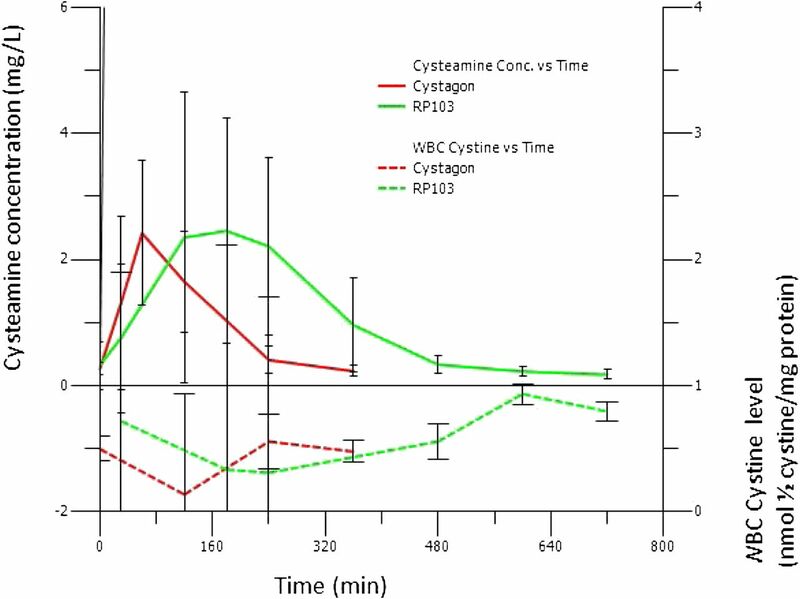 We performed a randomized, controlled, crossover design trial that demonstrated that there was no difference in control of WBC cystine content when immediate-release cysteamine bitartrate (Cystagon) used Q6H was substituted with a novel delayed-release formulation of cysteamine bitartrate (RP103) administered every 12 hours. We demonstrated equivalent excellent control of WBC cystine levels with the latter product compared with the currently available form of cysteamine bitartrate. Because treatment with oral cysteamine can prevent, or significantly delay, the complications of cystinosis (12,13,25–28), early and accurate diagnosis as well as proper treatment are critical. Cystagon, approved in 1994 in the United States and 1997 in the European Union, requires a strict Q6H dosing schedule, including a midnight (or middle of the night) dose, and has significant side effects (29–32), resulting in poor adherence in up to 70%–80% of patients (14). In the RP103 arm of the crossover study, patients were able to tolerate higher total single doses twice a day without using concomitant PPIs and to maintain an effective treatment regimen with no sleep interruption. Some patients still experienced gastrointestinal side effects, possibly triggered by gastrin secretion through central nervous system pathways (33). The average pharmacokinetic curves of cysteamine (Figure 2 and Table 3) demonstrated that the Cmax of a larger, single Q12H dose of RP103 compared with two consecutives Q6H single doses of Cystagon (e.g., 560 mg versus 400 mg, respectively) was not dissimilar, supporting the notion that the Cmax is generally correlated with side effects (33,34). Thus, our observation of not finding any AEs for RP103 different from those listed for Cystagon in the package insert, and finding that the relative frequency of side effects did not differ between the two drugs, thereby defining a comparable safety profile for RP103 compared with Cystagon, has some basis in the observed pharmacokinetic characteristics (Cmax) of the study drug. This study had some limitations. As explained above, it was not blinded nor did it use a placebo group. However, because the period and sequence factors of the mixed model were not significant to the results (data not shown), and because the primary efficacy endpoint was a measured WBC cystine level, we do not believe that this compromised the reported results. In addition, patients had to be well controlled under Cystagon to be eligible for this study. In real-world practice situations in which patients are not always optimally controlled as defined by WBC cystine levels, those who could actually benefit even more from the new formulation are likely those who are nonadherent with the strict, time-based, and frequent Cystagon dose regimen. In this study, we studied patients with native kidneys, CKD stage >4, and age >6 years. We will address those who were excluded in an ongoing extension study that will allow open-label treatment with RP103 to these other patient groups. Lastly, we did not study treatment-naïve patients with nephropathic cystinosis, due to its ultra-rare incidence. According to the US Food and Drug Administration (35), pediatric patients should limit use of an over-the-counter PPIs to 14 days at a time (up to three times a year). More recently, a petition by Public Citizen outlined that PPIs are often prescribed outside of their approved uses, for purposes such as stress ulcer prophylaxis in noncritical hospitalized patients and long-term treatment of conditions such as gastroesophageal reflux disease past the approved time frame. It has been estimated that up to two-thirds of all individuals taking PPIs do not have a verified indication for the drug. Based on the observed experience in this study, patients using PPIs during Cystagon treatment were able to stop their usage during RP103, thereby raising the question as to whether RP103 represents at true opportunity to reduce PPI usage. The number of gastrointestinal-related AEs was three-fold higher during the RP103 treatment period. It is possible that the 87% reduction in PPI use during RP103 periods is a potential reason for the increase, but the study was not designed to answer this question. This will be addressed in our long-term study, but cannot be answered here definitively. None of the SAEs reported in the study were considered unexpected, given the side effect profile of Cystagon and the symptoms associated with the disease itself. The number of AEs was three-fold higher during the RP103 treatment period. The total daily dose of RP103 necessary to maintain a well controlled WBC cystine level is lower than the total daily dose of Cystagon necessary to maintain WBC cystine at a comparable level, consistent with a finding reported in a previous publication of a different delayed-release formulation (16), although at a higher total daily pill burden in the current study. As with Cystagon, the long-term treatment dose of RP103 for every patient should be determined by the peak WBC cystine level. On the basis of these results, the authors recommend that patients who are already well controlled under a stable daily dose of Cystagon be switched to an initial RP103 total daily dose equal to 70% of the Q6H total daily dose of Cystagon. If deemed necessary based on subsequent WBC cystine measurements, the RP103 dose could be titrated up in 10% increments to reach an optimal, steady-state dose. Additional data on steady-state dosing of RP103 relative to Cystagon from the ongoing extension study may inform future recommendations on maintenance phases of RP103 dosing. Based on the convenience of twice-daily dosing and on our observations that an extended release form of cysteamine bitartrate can effectively keep WBC cystine levels in an optimal range for patients with cystinosis, we suggest that long-term patient adherence will be improved. If such adherence benefit is proven in real-world use, the deleterious effects of cystinosis on both kidney function and extrarenal organ impairment may be substantially ameliorated. P.R. and M.J.B. are employees of Raptor Pharmaceuticals Inc. The investigators thank the patients, their parents and guardians, the staff at each site, and the cystinosis patient-based foundations worldwide for the success in recruitment, enrollment, and study conduct. This study was funded in its entirety by Raptor Pharmaceuticals Inc, with the support of Grants UL1 RR025741 and UL1 RR025008 from the National Institutes of Health Clinical and Translational Science Awards program of the National Center for Research Resources.